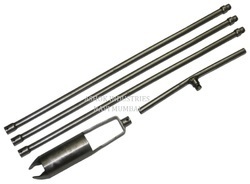 Pioneers in the industry, we offer hand soil auger and bucket auger from India. Backed by a highly skilled and efficient workforce, we are engaged in manufacturing and supplying superior-grade Hand Soil Augers. They are made at our state-of-the-art infrastructure unit in compliance with industrial standards of quality. They are fabricated under the guidance and leadership of industry experts by using qualitative raw-materials. They are renowned for their rust-resistance and abrasion-resistance. They boast of a scratch-proof surface that has a flawless finish. Our production process is highly streamlined owing to the efforts put in by our team members. 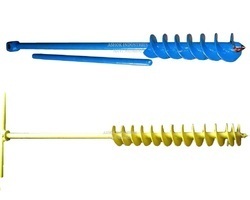 These hand augers are also known for their simple designs and portability, owing to which they are highly demanded by various industries. Their sturdiness renders them highly resistant to strong impacts and damage. They are ideally suited for rugged use. Their dimensionally accurate designs facilitate ease of installation. They are convenient to maintain as well. We supply them to our esteemed clients in customized specifications at affordable prices. We are offering Bucket Auger to our clients.